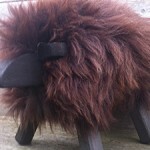 We make unusual footstools in the character of sheep, bulls or cows, each one has a special name. Put your feet up and relax on a Bo peep sheep. A great gift for friend or family or treat yourself to one. The sheep are hand made in Cambridge made with redwood and upholstered by Lucy Locket or Bo Peep with a 100% natural british sheepskin. 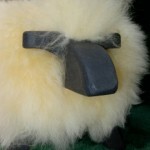 Size: sheep footstools are about 35 cm high and 28 cm long, and weigh around 3 kg.